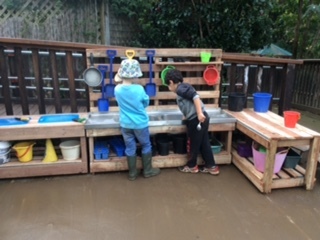 International Mud Day was celebrated on June 29 and there was no better way to enjoy the wonderful sensory experience of mud than by getting down and dirty in our new mud kitchen! Mary Rivkin an Associate Professor of Early Childhood Education at the University of Maryland says the rich and diverse experiences of cooking in a mud kitchen offer a world of sensory and learning experiences for children. Creative expression and invention – mud can become anything! 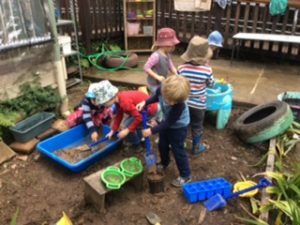 Problem solving opportunities – for example how to make soup thin or thick, how to make mud meatballs stick together. Cooperative play possibilities – let’s cook dinner, let’s make a restaurant, let’s feed the baby – you be the baby! Stress reduction – being outdoors in nature helps children relax. 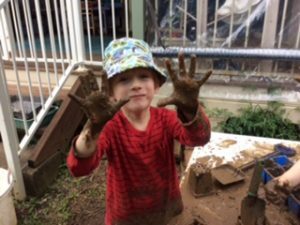 Building stronger immune systems – research indicates that some exposure to dirt helps build resistance to bad bacteria. Growing affection for the stuff on our earth – soil, stones, sand, and growing plants – leading to care and appreciation for our planet. 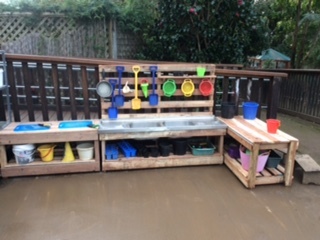 So whilst our children are busy immersing themselves in the good stuff, Dawn Song would like to thank Dawson Made for creating our wonderful mud kitchen and with it, the endless opportunities to create, build, play and learn.